DuckDuckGo is a search engine used daily by 20 to 25 million users. It has processed 6+ billion queries till date. It is one the best search engines right now. DuckDuckGo browser is an app built by the team behind DuckDuckGo. Its size is 10 to 12 megabytes. Is DDG browser as powerful as Firefox and Chrome? Does the search engine track your online activities? Is DDG as smart and powerful as Google, Microsoft Bing? Let’s find it out! The design of the DuckDuckGo app is similar to that of other browsers. The application flaunts a top bar that contains an address bar, menu icon, and two buttons. DDG provides a dedicated button to erase the browsing data from the phone’s storage memory. The button is located at the right side of the address bar. To its left side, you’ll find an icon with a label “A”. When users tap this icon, the browser will open the Privacy Dashboard interface which displays website security-related issues, the number of trackers the browser has blocked till date, and an option to enable or disable Privacy Protection. What happens you turn on the privacy protection? The app will automatically detect and block tracking networks. Hence, websites won’t be able to display ads. Also, the third-party web services won’t be able to track your ISP, browser, phone, etc details. Apart from blocking trackers, the DDG app also provides a brief information on the websites that track users with scripts or install tracking cookies on the phone. DuckDuckGo browser will analyze the website security each time you open a website. Then, it rates the website’s privacy practices and displays the same in the Privacy Dashboard. 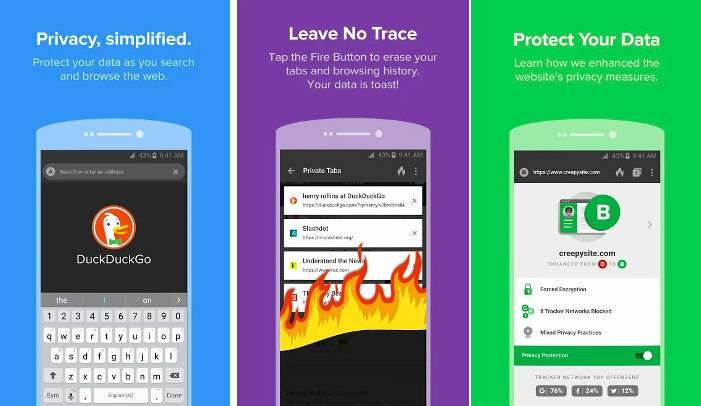 The DuckDuckGo browser app supports tabbed browsing. It displays the list of active tabs in a single interface instead of an annoying scrollbar. To close the tab, users can either tap the close icon or click the clear button next to the address bar. Like other top search engines, DDG displays search suggestions when the users enter letters/words in its text box. The suggestions in DuckDuckGo are not based on your browsing history. DuckDuckGo enables you to filter search results. The filters are easy to use and they’re located at the top of the results. Users of DDG can filter results by country and time. If there’s news on the keyword you’ve entered in the text box, the DDG will display a news carousel embedded within the search results page. DDG provides a cool feature called Bang that enables users to search information directly on 100s of websites. To use this feature, users must enter the character “!” in the textbox. Then, they must select the website from the drop-down list. DDG might display ads on the search results page. You can disable the advertisements from the app’s setting interface. DDG is the only major search engine that doesn’t track online activities. It allows you to find images, videos, etc. It also enables you to go through the latest news in your country and city. You can also see the price of the stocks with it. DDG allows users to change the search result page’s font, width, background color, etc. You can also customize the result’s title and description color. By default, DDG displays the full URLs below the search result description. You can change the position of the URL or make the app display shorter URL instead of a longer one. You can’t change the search service provider. Doesn’t track what the user does on the web. Conclusion: The DuckDuckGo app prevents websites from sniffing your browsing data. It requires 10 to 20 MB RAM and ROM. DDG is the best alternative to other search engines. DuckDuckGo is a great alternative to other search engines. It supports customization and has features that you want you won't find in other similar applications.